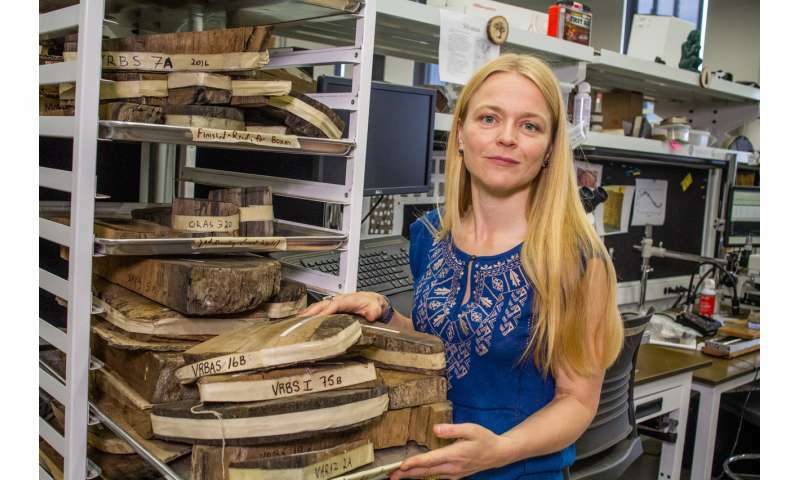 New analyses that use tree rings could settle the long-standing debate about when the volcano Thera erupted by resolving discrepancies between archeological and radiocarbon methods of dating the eruption, according to new University of Arizona-led research. "It's about tying together a timeline of ancient Egypt, Greece, Turkey and the rest of the Mediterranean at this critical point in the ancient world—that's what dating Thera can do," said lead author Charlotte Pearson, an assistant professor of dendrochronology at the UA Laboratory of Tree-Ring Research. "What we can say now is that the radiocarbon evidence is compatible with the archeological evidence for an eruption of Thera in the 16th century BC," Pearson said. Thera's explosive eruption on Santorini more than 3,400 years ago buried the Minoan settlement on the island in a layer of ash and pumice more than 130 feet (40 meters) deep. The effects of the eruption were felt as far away as Egypt and what is now Istanbul in Turkey. "The volcano erupts and represents one short moment in time," she said. "If you can date precisely when that moment is, then whenever you find evidence of that moment at any archeological site, you suddenly have a very precise marker point in time—and that's really powerful for examining human/environmental interactions around that time period." Archeologists have estimated the eruption as occurring sometime between 1570 and 1500 BC by using human artifacts such as written records from Egypt and pottery retrieved from digs. Other researchers estimated the date of the eruption to about 1600 BC using measurements of radiocarbon, sometimes called carbon-14, from bits of trees, grains and legumes found just below the layer of volcanic ash. By using radiocarbon measurements from the annual rings of trees that lived at the time of the eruption, the UA-led team dates the eruption to someplace between 1600 and 1525, a time period which overlaps with the 1570-1500 date range from the archeological evidence. "There's been a huge debate about the timing of the Thera eruption and radiocarbon versus archeological dating," Pearson said. "Our data indicate that radiocarbon dating can overlap with various lines of archeological evidence for the eruption date." The current radiocarbon calibration curve that was developed over the past 50 years using tree rings extends 14,000 years into the past. 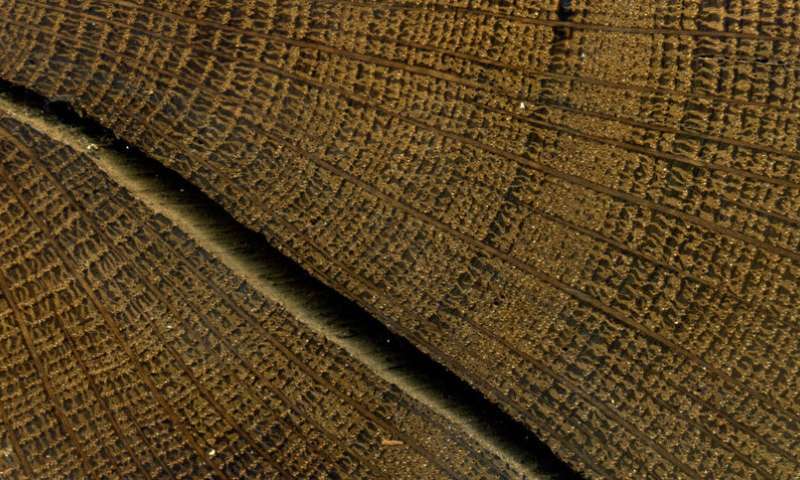 At that time, the scientists needed to use chunks of wood that combined 10 to 20 years of a tree's annual rings to have enough wood to test for radiocarbon. Work conducted at the UA Accelerator Mass Spectrometry Laboratory contributed substantially to the radiocarbon calibration curve currently in use worldwide. Now radiocarbon testing requires just slivers of wood, so Pearson and her colleagues could test the annual growth rings of trees from 1500 back to 1700 BC—before, during and after the time Thera was thought to have erupted. The 285 samples of annual tree rings were analyzed for radiocarbon at the UA AMS lab. Co-author Gregory Hodgins, director of the UA AMS lab, said, "Charlotte is redoing the calibration curve at an annual scale. What fell out of that was that the old calibration curve wasn't precisely correct during this time frame." The paper, "Annual radiocarbon record indicates sixteenth century BC date for the Thera eruption," by Pearson and her colleagues is scheduled to publish online Aug. 15 in Science Advances. Her other UA co-authors are Peter Brewer, Timothy Jull, Todd Lange and Matthew Salzer. Other co-authors are David Brown of Queen's University in Belfast, UK, and Timothy Heaton of University of Sheffield, UK. Pearson learned about the Thera eruption while studying archeology in college and has been fascinated by the eruption and its aftermath ever since. Narrowing the date for the Minoan-era eruption of the volcano Thera is so important for Mediterranean archeology that there have been whole conferences about when that eruption occurred, she said. Pearson wanted to know whether current dendrochronological and radiocarbon techniques could provide a more precise date for the eruption. "Every tree ring is a time capsule of the radiocarbon at the year in which it grew, so we can say here's a tree ring from 1600 BC and here's how much radiocarbon is in it," she said. The radioactive carbon-14 within an annual tree ring decays at a steady rate and can act as a clock indicating when the tree grew that ring. Pearson and her colleagues used two different tree-ring chronologies from long-lived trees that were alive at the time of the Thera eruption but were growing 7,000 miles apart. 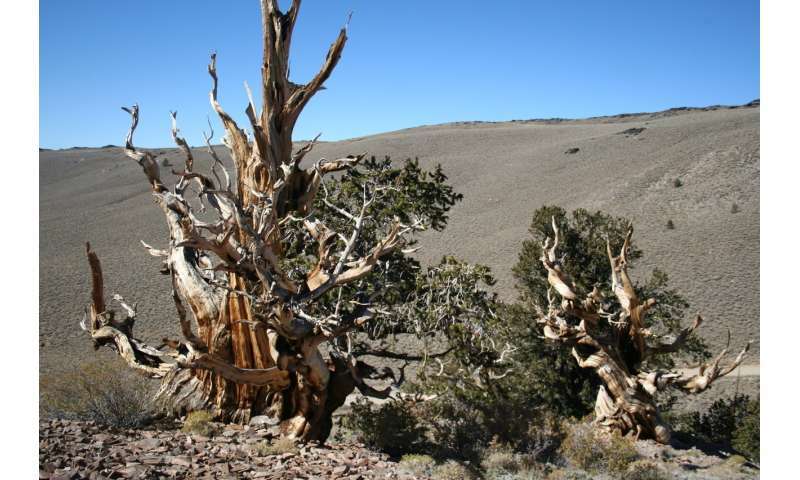 Salzer's extensive work on long-lived bristlecone pines living in California and Nevada provided the 200 tree-ring samples representing each year from 1700 to 1500 BC. Brown provided 85 Irish oak annual tree-ring samples that spanned the same years. A massive volcano such as Thera ejects so much material into the atmosphere that it cools the earth. For cold-climate trees such as Irish oaks and bristlecones, that exceptionally cold year shows up as a much narrower tree ring. Salzer's work reveals at least four different years within the new radiocarbon age range for Thera where the bristlecone pines had exceptionally narrow rings that might indicate a huge volcanic eruption. "What we're doing in this study is using the annual nature of tree rings to improve the existing calibration curve for radiocarbon," Pearson said. "We wanted to tackle this time period in hopes we could use this to shed new light on the Thera debate." Hodgins said, "This research is about Thera, but really, the implications of it are profound for anyone that uses radiocarbon dating throughout the world for this time span. There's a kind of revolution in the radiocarbon community to revise the calibration curve using these more precise measurements." Other research teams are also finding discrepancies between their radiocarbon measurements using annual tree rings and the current radiocarbon calibration curve, he said. Pearson, still fascinated by Thera, hopes future research can nail the eruption down to a particular year. Lots of assumptions going into the dating methods need to be laid on the table and possibly re-examined for this type of work. I too find myself physically attracted to volcanoes, I would like to date one as well... dormant or active! Which is what they did, except of course that this is not about ad hoc "assumptions" but verifiable calibration.This is not religion based on unlikely assumption, this is science based on data. These kinds of small scale variations to allow higher precision - since there is demand for it - has been known to be necessary and worked on for 50 years, according to the article. "Lots of assumptions going into the dating methods"
Dendrochronology can determine dates down to the year and even the season. Hardly an assumption. This does not refer to dendrochronology. It refers to radiocarbon dating with C^14, which is my effort to note the isotope "carbon-14". I thought the current dating of Thera eruption is 1614 plus or minus 14 years, with 95% probability. "Science", 28 April 2006: 508-509. == Santorini Eruption Radiocarbon Dated to 1627-1600 B.C. Science 28 April 2006: 548. A buried olive tree provides a firm early date for the massive Santorini eruption, facilitating correlations among Bronze Age events throughout the Mediterranean. == Chronology for the Aegean Late Bronze Age 1700-1400 B.C. Science 28 April 2006: 565-569. 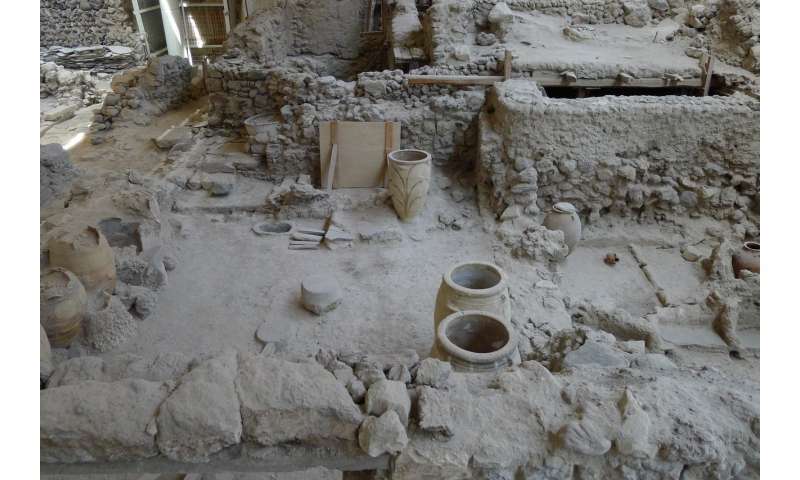 Radiocarbon ages from the Aegean region, along with the new age for the Santorini eruption, revise the inferred relations among Minoan, Egyptian, and Near Eastern cultures. Actually it does refer to dendrochronology since radiocarbon calibration curves for the Holocene are constructed using tree rings dated by dendrochronology. In the above work by Pearson et al. single tree rings of known age from Irish oak and American bristlecone pine were radiocarbon dated and their radiocarbon age was compared to the current itteration of the internationally accepted radiocarbon calibration curve IntCal13. Mastoras, you are correct that Thera has been dated to the later half of the 17th century BC, but this has been dated using the current radiocarbon calibration curves. If, as suggested by Pearson et al., this curve is in error at this particular point in time, then the current accepted date will be inaccurate. If Pearson et al. are correct, then it is likely that Thera will be younger than the current radiocarbon calibration, and likely have erupted in the 16th century BC, more in line with what is suggested by archaeological interpretations. Now, the hunt must begin for those other three major eruptions.